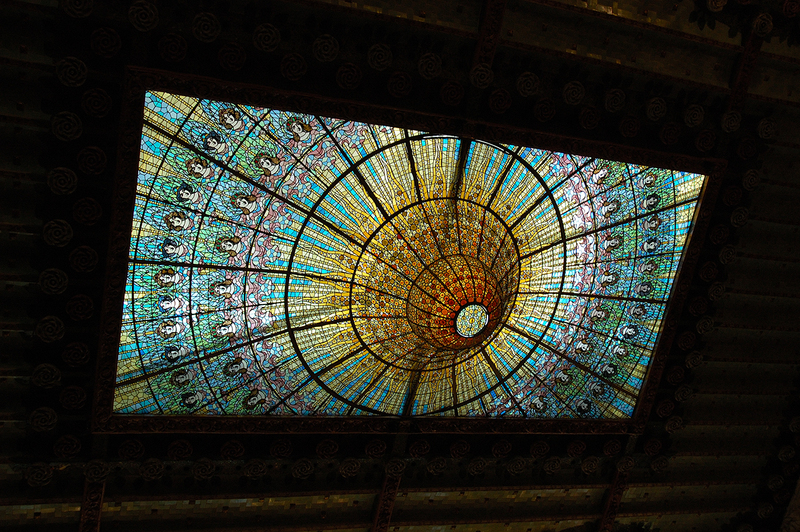 If you think you have seen it all regarding art nouveau stained glass windows or ceilings then you have not visited Palau de la Música, the outstanding representative of Catalan modernisme built by Lluís Domènech i Montaner in 1908. As many of you already know this is a must see when visiting Barcelona. 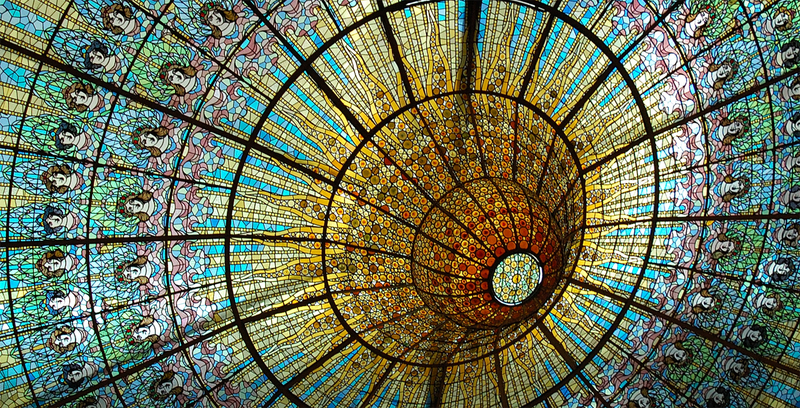 There are guided tours so save a little time for admiring it but don't worry if you can't make it to Barcelona, you can go on an incredible 360 virtual tour inside Palau de la Música Catalana for starters. Taking pictures is not allowed so I don't know how this snap got into my camera anyway. Check the full view here. You're right, we ain't seen nothing till we've seen this! Absolutely stupendous. Amazing also how things end up in our cameras without us knowing! Check out what happened to Eric of PDP on his Censored post of the Prison de la Sante a few days back! -I had noticed the "censored" sign in Eric's post and I will take another look at it. Thanks for the kind comments. Hello Carlos, gorgeous pic, so sharp and colourful! Thank you for sharing this stunning photo...and the commentary. Just lovely! That's a fabulous picture - thank you! I'm so happy about your inquisitive camera. It is an incredible ceiling/window! Colours and patterns delight the eye! now this! Thank you so much for photo and links. Carlos, amazing beautiful shot, it's so fine and you got the details very well! Magnífica, Carlos. De debò, esplèndida! _Hola cèsar, estic molt agraït! The only thing I can think of... Wow! Hello there Carlos. Greetings from Texas. This is so beautiful! Thanks Pixibition, Edulabbe, Sally, Chris & Deb, thiên. It was worth "stealing" the image. Thanks lisi too. This is without doubt one of the very best shots I've seen this week Carlos, brilliant! Great exposure and sharpness, well done! The homeless man had me thinking too, I wonder how his Christmas will be? 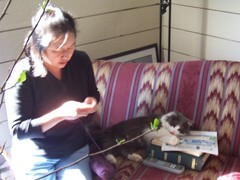 I would like to post this picture on my website. I will credit you as the source. Is that okay with you? Absolutely gorgeous! Thanks for sharing. IS the original totally 2 dimensional or is it partially 3 dimensional?